When I think back to my childhood holidays, I often reminisce on the fabulous dresses my mother put me in. So often these fab little holiday numbers included velvet fabric or bows, so naturally, I'm hankering for some of the soft, sensuous, jewel toned velvet clothing that re-emerged this fall. If you are only going to invest in one item of velvet clothing, make it a velvet blazer. It's a holiday season staple and can take you everywhere from weekend errands to a cocktail party with co-workers. Personally, I love the look and feel of a velvet maxi skirt and am thinking of snagging this on sale T by Alexander Wang. I'd pair it with a white t-shirt, my favorite vintage jean jacket and some moto boots. 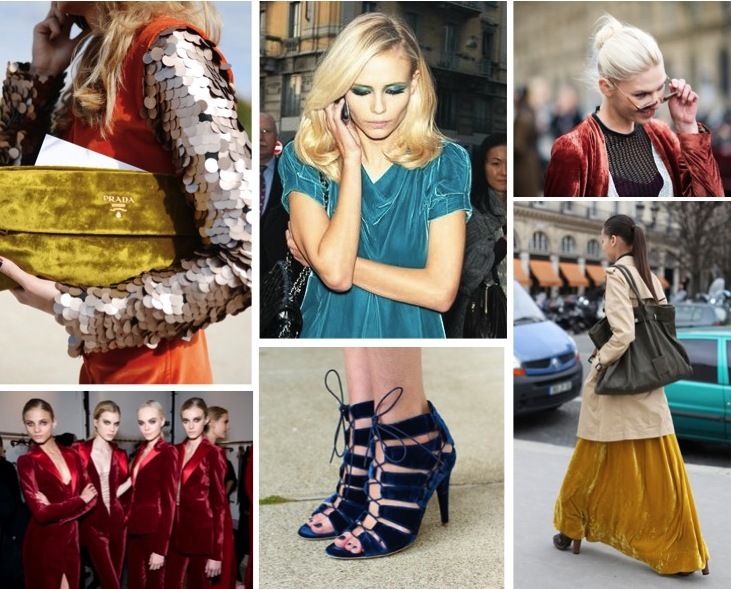 Have a look at some of the awesome velvet clothing below, which makes a perfect addition to winter wardrobes. Those velvet shoes and blazer amazing ! Love the first sequin blazer!!! Completely agree with you on the velvet blazer. I'm personally not a big fan of velvet but it just fits right with a blazer and winter. lol! I totally love velvet for the holidays, too! I did a similar post with a navy dress I'm in love with, but a velvet blazer is an equally glam option!